Our President and CEO, Maury Blackman, kicked off the keynote by talking about our role—and the role of the Accela Civic Platform—in bridging the disconnected worlds of government and citizens. He emphasized the importance of speaking government, speaking citizen and even speaking “geek” with the developers in the audience. Ultimately, we believe our role is to help government agencies better engage with the citizens and businesses that live and work in their communities, and to get these differing groups to work together to build and grow those communities. We discussed some key values like trust, love, creativity and engagement, and how our journey involves making choices and taking a position in the market. Everything we do across every part of our organization needs to pay off on our promise. As one small example: we want people to love their communities and to have joyful experiences interacting with the agencies where they live and work, and the Civic Platform can make that a reality. That means our products must offer delightful interfaces and outcomes. The rest of the general session was outstanding with guest customers from Hillsboro, Oregon, helping the audience to understand the world of building officials. They talked about their pain points and how, despite working tirelessly with businesses and citizens, they still have issues informing the public of what they do and meeting simple regulatory requirements like saving historical files. 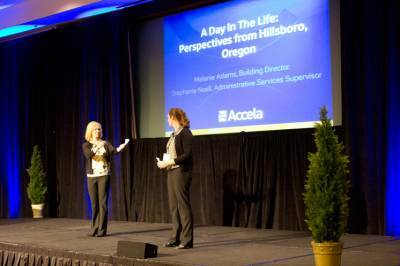 Melanie Adams, Building Director, and Stephanie Noell, Administrative Services Supervisor with the City of Hillsboro, Oregon share a day in the life. We heard from Rob Cassetti, our VP of Sales, and Lee Ann Slinkard, our SVP of Services, who talked more about Platform Innovation and how, by working together and leveraging our collective expertise, we can more easily address the needs of our current and prospective agency customers, large and small. Our product team provided the audience with a deep dive into capabilities, but also provided an update on how we will improve the overall user experience through role-based user interfaces, a streamlined experience and multi-browser support. We discussed simplifying and improving configuration efficiency through best practice templates, packaged solutions and lightweight tools. We closed the day with a Public CIO panel, which included Washington State, Salt Lake City, Utah, and Washoe County, Nevada, and a Developer panel with Open Counter, Buildingeye, Appallicious and our own Kris Trujillo that provided deep insight into the issues and opportunities for all of us to deliver value to all types and sizes of agencies and jurisdictions. 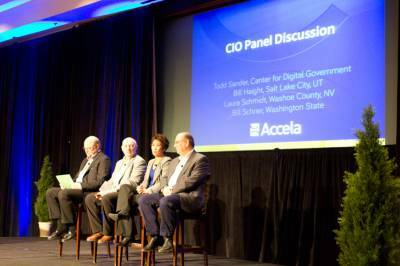 Todd Sander with the Center for Digital Government moderates the Public CIO panel with Bill Haight of Salt Lake City, Laura Schmidt of Washoe County and Bill Schrier of Washington State. The second day gave us all a chance to roll up our sleeves with different types of partners and developers to share our strategy and plans and to address areas where we can work better together. More on that in another post. We feel like we’ve found our “True North.” We know that a big opportunity exists ahead of us and it is our growing ecosystem of partners and developers who can help us bridge the worlds of citizens and governments, to not only build great communities but also to offer great experiences. We know that by being laser-focused on customer success, we can be a better guide for our agency customers as we help them achieve their visions of more engaged, more productive and more transparent government. And we know that as our ecosystem grows, we’ll enhance our ability to innovate and deploy more solutions more quickly. We look forward to sharing more on this vision in the coming days. What Does the Civic Platform Mean to Me?